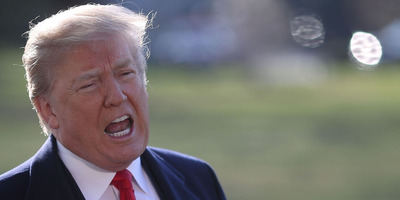 President Donald Trump defended his decision to congratulate Russian President Vladimir Putin on Tuesday for his lopsided victory in the country’s election last week. The comment is the latest indication of the president’s unwillingness to confront Putin on Russia’s increasingly authoritarian image and aggression against the West. President Donald Trump took to Twitter to publicly address blowback over his decision to congratulate Russian President Vladimir Putin during a phone call on his victory in the country’s election last week. The Washington Post reported Tuesday evening that advisers included a warning in Trump’s briefing materials before the call, which said in all caps: “DO NOT CONGRATULATE” Putin on winning the Russian election last week. Trump’s decision to congratulate Putin on his victory prompted immediate criticism from lawmakers who are more hawkish toward Russia, like Arizona Sen. John McCain. Meanwhile, Trump’s decision to ignore his advisers’ guidance and congratulate Putin – and to later defend the move – adds another layer to an emerging portrait in which the US president has demonstrated a reluctance to confront the Russian leader amid an ongoing investigation into whether the Trump campaign colluded with Moscow to tilt the 2016 election in his favour. Former CIA Director John Brennan told MSNBCWednesday morning that he was baffled by Trump’s unwillingness to push back against Putin.